Lalocura's clay pot distilled mezcales have built a steady cult following of chefs, writers, and mezcal-heads, who turn up at the palenque each day hoping to spend a few hours listening to maestro mezcalero Eduardo "Lalo" Ángeles tell stories, taste the 20+ expressions he has resting in glass at any given time, and instagram a photo of his colorful dining room table covered in empty veladoras. Before starting Lalocura in 2014, Eduardo Ángeles spent years working as the fourth generation master distiller of his family’s label Real Minero, where he combined a lifetime of working under his father, the late, great Don Lorenzo with a degree in agricultural engineering, and a philosophy that is all his own. As conscientious of where he sells his bottles as he is of what goes into them, Lalo's mezcal has only been available outside of the palenque at a select few venues in Mexico. 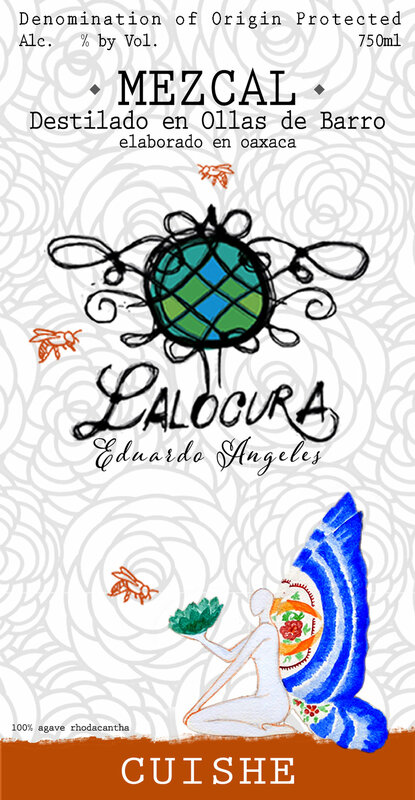 Lalocura is produced in Santa Catarina Minas, Oaxaca, where Maestro Eduardo Ángeles was born and raised, where he learned to distill from his father, and where his palenque is located today. Like all traditional mezcales made in Minas, the agave piñas are roasted in an earthen oven, mashed by hand, fermented outdoors, and distilled in clay pots. It's a process that has produced great mezcal for centuries. Like great chefs and winemakers, Lalo's aim is to showcase the quality and qualities of his ingredients. His mastery of technique isn't used to transform the agave into something new and different, but rather to help express their subtlest flavors. The tasting notes for each batch will vary, but at the core of each bottling you will find the true essence of the agaves used, and in a very magical way, the character of Santa Catarina Minas, Lalo's home town. We welcome visitors to the palenque most days between 9 am - 4 pm. Our English is limited (we had friends translate this) so it will be helpful if at least one member of your group speaks Spanish. Please email us here to let us know when you would like to come by, and we will do our best to accomodate you. SACRED Agave is a non-profit organization dedicated to improving life in the villages where mezcal is made. To date, the group has funded the construction and maintenance of libraries, greenhouses and water reclamation projects in Santa Catarina Minas, where Lalocura is made. Based out of Chicago, the group hosts rare agave spirits tasting events, inviting guests to experience the beauty of rural Mexico, while developing a two way connection that goes beyond a simple transaction. Please visit their site to learn more about how you can get involved.